You are here: Home / Timber Infestations / 'Woodworm' / What is woodworm? Well, if you’re a timber infestation surveyor like me, it usually means the Common Furniture Beetle Anobium punctatum. However, if you’re a house buyer, seller or any lay person, it usually means anything which has left holes in wood. And there is the problem; woodworm is an emotive generic name. Anything with ‘worm’ in the name has got to be bad; shipworm, ring worm, tape worm….eeek! Where there is fear – there is money to be earned;alleviating that fear…. So yesterday I find myself having to explain to my prospective client why I have not recommended treatment for the ‘woodworm’ in his kitchen floor, “When the other company found it – how come you missed it”? 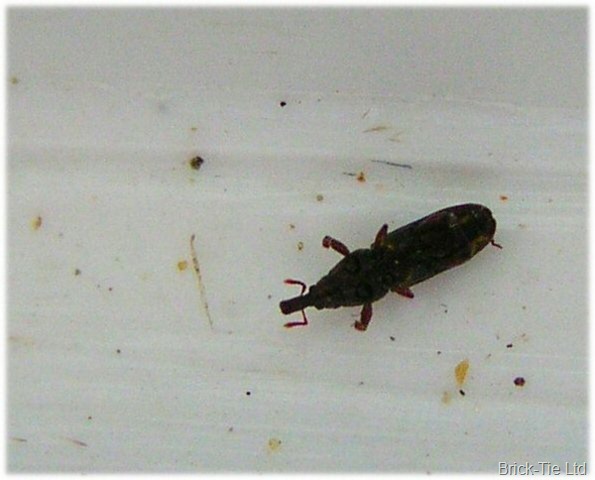 I explain that the ‘woodworm’ in this Leeds terrace house is only the Wood Boring Weevil Euophryum confine, a species of insect which only ever infests rotting wood. The wet rot work we are doing will eliminate it – It is mentioned in my report, but I have not specified an insecticide – because there is never a need to use insecticidal fluids on it. “But I’ve seen the holes” he exclaims “there’s woodworm and it could spread if it’s not treated”. I explain some more….eventually he concedes and somewhat grudgingly appears to accept that the treatment of the floor timbers throughout the ground floor of his house, is not necessary to eradicate the Weevils – infesting the three rotten joists in his kitchen. I am yet to receive an order for the work though. Now then, this client is a bright, professional chap and I have some credibility and qualifications too – so why did he struggle to accept the truth.? I note that the opening paragraph of this specialist company’s report says (I paraphrase), “…we do not recommend works unless they are essential”. It helps if you use generic terms too, so it is hard to prove ill intent. Woodworm for instance is not a scientific name so nobody can prove just what the ‘specialist’ thought he saw. That is why all Property Care Association members and reputable surveyors involved in timber infestations use a bit of Latin in their reports. It’s not for bamboozelment – or pretention. It’s for the protection of customers and for reasons of accuracy. If you are offered ‘woodworm’ treatment..get a second opinion and ask the surveyor to identify the species… exactly. PS – Brick-Tie Preservation have just recieved an order for the Wet Rot treatments on the above project: Preservation expert 1 : Unqualified specialist 0. I think you should maybe have signed off this blog as ‘Serpula Lacrymans’!!!!! I am from so. calif. I have a infestation of a very tiny bug, They are not leaving round exit holes, but the holes are not consistent in shape or size. When i run my hand over the floor it feels like sand paper. They seem to have no babies all the time. They not only infest my laminate wood floor, (pressed wood with laminated top layer) but have infested every door from which is made of compressed wood, from the floor and up to about 3″. All the baseboards made of the same material. The closet tracs which are metal painted white they can literally almost in side the metal. I took a torch to one and after an hour at the highest temp. i still saw life. Very invasive. When i look at the bottom of my shows i see little black specs and they will continiue to live within the sole of my shoes. I now have them in my carpet inside my car. It appears that they can and will eat anything. I have taken a touch to my floors and still cannot find relief. I have tried chemicals that list numerous beetles it will control/kill. Nothing works. I had a pest company come out. 3 of them to be exact and none had the expertise to spot anything other than normal house pest. FLeas, flies, cockroches termites. Also none are licesnsed to treat anything other than the normal pest. I did send out some samples to an entomologist who said he found casemaking moths, carpet beetle. Then another said various insects along with drugstore beetle and carpet beetle. I have read and I do not think they match up. What do you think. There is also a lot of white specks on floor. I am sorry but my expertise on infestations covers UK species only. You need advice from a Calif based specialist. Good luck with it and thanks for gettinhg in touch.